As part of the SOCIETIES project, Caritas Bosnia and Herzegovina initiated the process of forming social inclusion working groups. The aim of these working groups is to enhance the participation and role of civil society organizations in the decision-making process and to exchange the knowledge and experience of these associations and organizations with public institutions on the processes of social inclusion of people with disabilities and the corresponding policies. 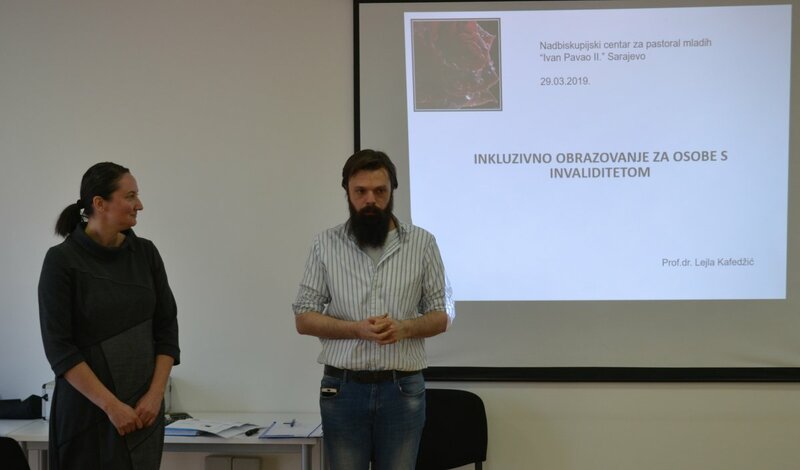 In this regard, a working group in Sarajevo held a meeting on 29th of March on “Inclusive Education for People with Disabilities”. The meeting of the working group brought together representatives of 10 CSOs, with the moderation of prof. Dr. Lejla Kafedžić from the Faculty of Philosophy of the University of Sarajevo. During the meeting, participants discussed basic obstacles to inclusive education of people with disabilities in Bosnia and Herzegovina, with particular reference to the Convention on the Rights of Persons with Disabilities, more specifically its Article 24, which obliges governments to provide an inclusive education system at all levels. Participants in the open discussion discussed their experiences in activities aimed at inclusiveness in education, positive examples, but all the disadvantages, especially those systematical ones. In the end of the meeting, the participants made a list of key recommendations and necessary measures to be implemented in order to bring Bosnia and Herzegovina closer to the standards of the European Union, in order to meet all the requirements of the conventions already signed and the adopted legal frameworks. The list of recommendations and measures includes the change of legal regulations and bylaws, i.e. their harmonization at the level of Bosnia and Herzegovina (different legal framework in each canton and at the entity level), cooperation with the CSO in designing the above mentioned legal framework, training and introduction of teaching assistants and personal assistants, etc. In the forthcoming period, additional meetings of the working groups for social inclusion of people with disabilities at the level of Bosnia and Herzegovina were planned. All the collected proposals and recommendations will be unified and final results or recommendations for creating new ones and redefining the existing social policies and legal framework will be presented at a national forum scheduled for June 12, 2019. Project SOCIETIES aims to assist civil society organizations in upgrading technical skills, or to contribute to the social inclusion of people with disabilities through the implementation of EU standards in South East Europe. The project is being implemented in five countries of Southeast Europe: Albania, Bosnia and Herzegovina, Montenegro, Kosovo* and Serbia with the support of experts from Italy and Bulgaria. The implementation of the project involves 16 partner organizations, including Caritas of Bosnia and Herzegovina. The projected duration is 48 months, until the end of 2019. The project is funded by the EU funds under the program of support for regional and thematic networks of civil society organizations.